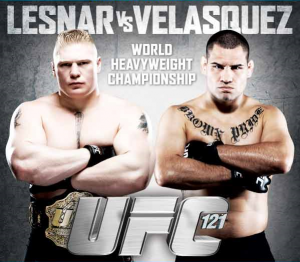 Brock Lesnar vs. Cain Velasquez UFC 121 | MMA Fighting Events Videos Techniques UFC Fight Picks and News. The UFC returns to California this Saturday October 23 with UFC 121. In one of the most anticipated heavyweight championship matches in a long time, Brock Lesnar will defend his title against an undefeated and fast rising UFC star, Cain Velasquez. After Brock Lesnar defeated Shane Carwin in UFC 116, he shut up most of his critics. He survived the knockout artist's best chingasos in the first round, and went on to win with a surprising submission in the second round. Lesnar now stands on top of the heavyweight division holding the belt, ready to pounce on any and all contenders. With his superior size, athletic ability, improved MMA skills, and ability to take a punch, Brock Lesnar looks unstoppable. Cain Velasquez has risen through the heavy weight division in the UFC by defeating everyone they've put in front of him, with his aggressive and unrelenting style. He has outstanding wrestling ability and has shown remarkable improvement in his stand up in each and every fight, culminating in out boxing Antonio Rodrigo Nogueira with a TKO win at UFC 110. He now takes his undefeated record into UFC 121, which will most definitely be a classic David vs. Goliath matchup. At the fight weigh in, Brock Lesnar needs to be at the heavyweight limit of 265 lbs, meaning he needs to cut weight and will most likely weigh at least 285 lbs by fight time. Cain Velasquez will most likely come into the fight at about 230 lbs. 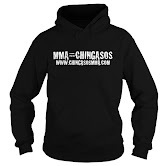 At the highest levels of MMA, a few pounds can make a big difference in a fight. Let's just say that Lesnar is going to have more than a few pounds to his advantage. What can Velasquez do to win? He's going to need to stick and move, scramble if he gets taken down, push the pace, take the fight into the later rounds, and hope that his superior endurance comes in handy. If Lesnar wants to retain his belt, he needs to smother Velasquez, punish him with his size and strength, and try to finish the fight early, as the only question remaining for Lesnar is his endurance.